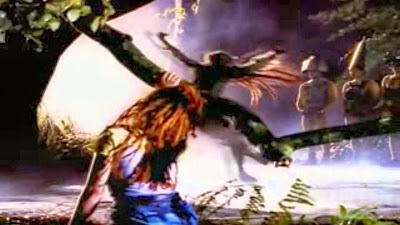 In 1996, new age musical project Enigma joined forces with British director Julien Temple and 1995 World Silver Medallists Susanna Rahkamo And Petri Kokko to present a first: a popular music video featuring figure skating as the storytelling medium. "Beyond The Invisible" is a haunting piece of music by the group that features not only the vocals of Sandra and Michael Cretu but samples of Latvian folk piece "Sajāja Bramaņi'" ("Nobleman Rode Together") as performed by the folk ensemble Rasa and a Gregorian chant (Isaiah 64:9-11) from "Gregoriani Cantus" by Pierre Kaelin. The video depicts the avant garde Finnish team skating in a forest: Savernake Forest in Wiltshire to be exact. An ice rink was designed in the forest especially for the video and took over a week to freeze. The compelling imagery in the video is unforgettable and the abstract imagery and vocals have been interpreted in completely different ways. Some believe the song speaks of afterlife and reincarnation, of reaching a Home beyond Earth as we know it; that the lyrics propose the conflict between light and dark. "Close your eyes, just feel and realize it is real and not a dream, I'm in you and you're in me. It is time to break the chains of life, if you follow you will see, what's beyond reality," have been interpreted by others to talk about quantum psychology, buddhism and oneness and how many of us struggle within the laws, rules and constrictions of religion to find some connection to the universe and nature we live in. Yet others focus on the message of the importance to create your own dreams, have conviction in your fantasies and to not do what everyone else is doing ("to break the chains of life"). This final description certainly seems fitting for the skating interpretation of music and even the choice of skaters. Rahkamo and Kokko were always well known and applauded during their competitive and professional careers for being risk takers - from batty bride and groom to Nino Rota to vikings and street dancers, the Finns were always daring, different and completely fearless. Breaking those "chains of life" can also be interpreted as breaking out of your daily routine and meditating or thinking quietly about what you really long for and acting on those desires. Beyond the spiritual and personal messages of the English lyrics, there is a much more bold message to the song if you look at the translations of the Latvian and Grigorian lyrics. "Sajaja bramani totari ta, raitata raitata, radu ridu raitata, rota" translates to "this is a dream your pants are still on" where "Ne irascaris Domine, ne ultra memineris iniquitatis: ecce civitas. Sancti facta est deserta: Sion deserta facta est: Ierusalem desolata est: domus sanctificationis tuae et gloriae tuae" translates to "Is this God? If so we need a revolution, like the civilizations in the desert, God has been corrupted, Sion is corrupt, Jerusalem is the devil... I despise the church...do not be angry Lord". If you look at those translated lyrics in context with the rest of them you see a bigger message about structured religion .vs. belief: a debate I won't even get into. What a lot of you, as readers of my writing, may NOT know is that I study spirituality as much as I can. I devour books on everything to Christian and Gnostic religions to reincarnation to every religion and "new age" belief imaginable like a big girl with a box of Smarties. I find it tremendously interesting that Enigma, who really is such a fascinating musical group in itself, chose to interpret and convey this message through skating. I can't imagine anything more spiritual than carving out edges on a frozen rink in the middle of a mysterious, ancient forest dating back in oral tradition to 934 AD. No matter how you interpret Enigma's "Beyond The Invisible" or the accompanying music video featuring Rahkamo and Kokko, one thing's for sure. It takes you to a different time and a different place and serves as evidence that skating and art aren't separated by a few degrees. They exist together. If you enjoyed this feature on Susanna Rahkamo and Petri Kokko and Enigma's "Beyond The Invisible", have I got JUST the thing for you! A Facebook page that supplements this blog and shares daily skating news, videos and features as well as all of the newest articles and interviews from the blog with you. All you have to do is click 'LIKE' at http://www.facebook.com/SkateGuard. If the Twitter's more your cup of tea, check out http://twitter.com/SkateGuardBlog and give me a follow! I love talking about skating and would love to do it with you. Now that just sounded dirty... But you know what I mean!